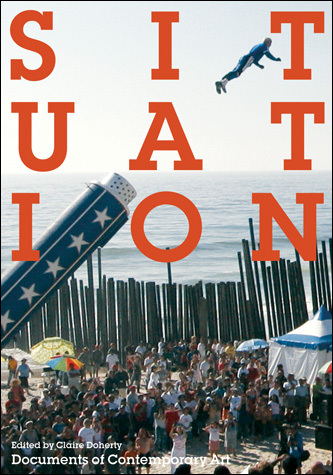 I read “Situtation” as I read most books these days: sitting on the Bay Area Rapid Transit, traveling between jobs. It’s the 6-10 jobs that keep my volunteer blogging to a minimum (no regular wifi on BART just yet). Still, I wanted to read– and write about– this book. Because how I read it is also how it’s structured: in small digestible chapters. Because Situation is a compilation of excerpts from primary sources, the words of artists and scholars, here and gone, about context and place in artmaking. The cited authors range from Lucy Lippard to Hannah Arendt to Robert Smithson (yes, THAT Robert Smithson) to Krzysztof Wodiczko. 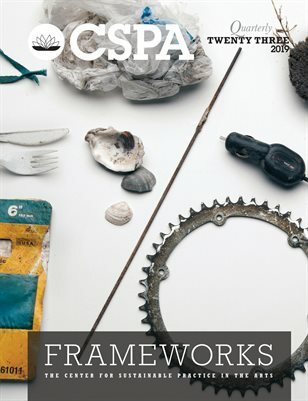 The excerpts are organized into four parts: “The Limits of Site,” “Fieldwork,” “Action and Public Space,” “Place and Locality,” and “The Curatorial Imperative.” Editor Claire Doherty does an excellent job of chaining seemingly unrelated sources together. And though there’s a lot of complaint about how media and television are affecting literature, that it read like a documentary was pleasant. On one page I’d be reviewing Smithson’s work with sites and non-sites: on the next I’d be reading Giorgio Agamben’s thoughts on witnessing. The experience was an ever-evolving collage of thought on place. Like a kaleidescope with some of the best thinkers of the last 75 years or so in it. Good for introducing yourself to new thoughts on space. Good for mental niblets between trains. Good for discovering new incredible people. 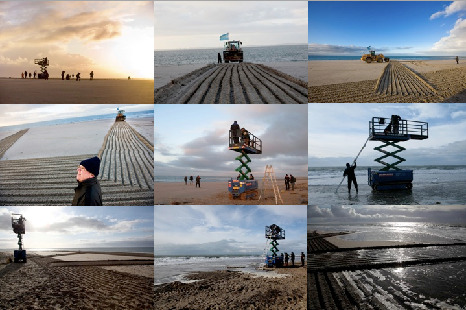 A year ago this week as part of the Portscapes project, the artist Jan Dibbets had what he called a “second attempt” at his 1969 piece 12 Hours Tide Object with Correction of Perspective; the artist and curators rejected the idea of the event being a recreation. The apparently parallel lines are drawn on the beach and disappear again within the space between two high tides. 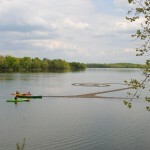 The original work became part of the canon of Land Art when it was included in Gerry Schum’s 1969 Land Art TV broadcast, alongside pieces by Robert Smithson and Richard Long. 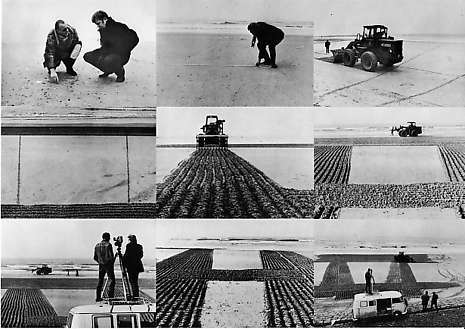 For Schum the attraction of Land Art was its liberation of art from the gallery. He was trying to make a TV-based form of art that suited the more democratic half of the 20th century. In the second attempt the work becomes more obviously about man’s relationship to the natural world, partly because Portscapes, which we list as one of the 21 highlights of 2009, was a series of commissions by Latitudes on a piece of land that will disappear as part of the new Dutch industrial port complex Maasvlakte 2. And the piece now seems to emphasise the tidal inequalities of that relationship. Just as Dibbett’s illusory parallel lines are seen being washed away by the rising tide, so this beach will soon be gone. That is another perspective shift, of a kind. 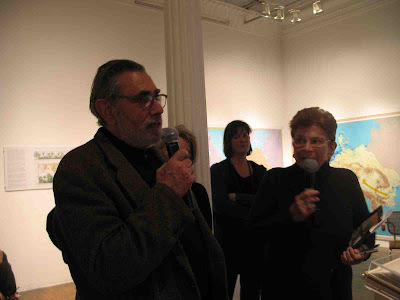 Amy Lipton hosted an Artist’s Talk with Newton and Helen Mayer Harrison. The artists led a gallery tour with over 100 in attendance through their new exhibition Global Warming at the Ronald Feldman Gallery. The Harrisons have been working together as a team since the early 1970’s and are two of the most influential living artists working today on ecological issues. They are considered to be pioneers in this field along with artists Robert Smithson, Han Haacke and Alan Sonfist and have been exhibiting artists at Feldman Gallery since 1974. Their practice is one of scientific inquiry, dialogic process, community engagement and collaboration. 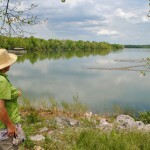 They work with biologists, ecologists, architects, urban planners and other artists to uncover ideas and solutions, which support biodiversity and community development. 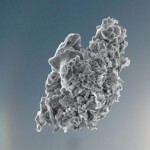 Working well ahead of the curve, their work must now also be considered within the context of relational aesthetics, though their revolutionary concepts proceeded the coining of this term by over two decades. 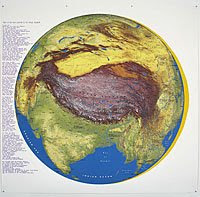 The walk-through of the Global Warming exhibition focused primarily on the Harrison’s new multi-media installation Greenhouse Britain, which toured the UK in 2007/8. The work consists of video, large panels comprised of text, mapping, photography and architectural models. 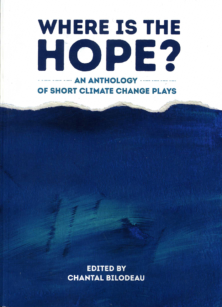 It proposes an alternative narrative about how people might withdraw as waters rise due to sea level change, what new forms of settlement might look like, and what content or properties a new landscape might have in response to the global warming phenomenon. It also demonstrates how a city might be defended. Greenhouse Britain includes 5 components, the first being, On the Island of Britain: The Rising of Waters. This large-scale model of the Island of Britain, rests on the floor, with six overhead projectors showing animated video of the rising waters, storm surges, and the redrawn coastline. A soundtrack of three voices accompanies the piece. A brief question and answer session concluded the tour with comments by artists Aviva Rahmani, Betsy Damon, Joan Bankemper, Jackie Brookner and others. The event illuminated the Harrison’s artistic process and history and exemplified the ways in which their art embraces a breathtaking range of disciplines. 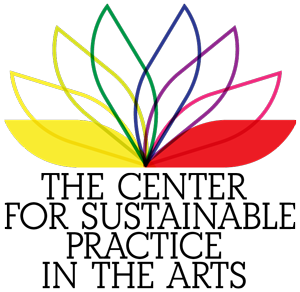 They are historians, diplomats, ecologists, investigators, emissaries and art activists. Their work involves proposing solutions and involves not only public discussion, but extensive mapping and documentation of these proposals in an art context. The talk was documented on video and will become available for viewing, please contact amy@ecoartspace.org for information.